I'm linking up to Crazy Mom Quilts with a finish today. This quilt started as an experiment a couple of years ago. I fished it out of my basket of other experiments-which-haven't-come-to-anything-and-are-looking-at-me-reproachfully and cut it up with no plan, other than to see what would happen. I re-ordered the cut up strips a little, and added linen in between and all around - but I wanted the original pieced strips to still look somehow linked so I added more quilting which runs right across. Then I quilted a series of boxes round the central panel using 28 weight Aurifil, a beautiful weight to quilt with if you want some definition to the quilting. Finally I raided my hoard of beach glass and sewed pieces all around in a gap in the quilting, using an Aurifil embroidery floss, and this really beautiful hand dyed skein of No 5 perle I found at a quilt show. If I do something like this again I might try piecing in, or appliqueing, little chips of coloured fabric, instead of the glass. The floss has a lovely sheen. I really love the texture of this quilt. I made a hanging rod out of an old piece of plumber's copper pipe - I hacksawed off a suitable length, polished it up a little with Brasso leaving it just a bit tarnished, and super-glued a marble in each end. I sewed tabs for the quilt, but they are only pinned on. It was difficult to get a picture because it kept blowing away despite my helper's best efforts! Actually though I think you get a better idea of its nature close up. Gorgeous quilt Catherine. Such a lovely way to display your treasured pieces of sea glass. And the quilting is so beautiful. It's beautiful, I love how you've used the sea glass in it and what a brilliant idea for the hanging rod too. Your mini quilts are always so gorgeously 'framed', definitely something I need to think about more. Love how this has turned out! I also thought it was smaller from the previous posts but to see it in its full finished glory is wonderful. It is soo evocative of the coast it's making me a little homesick for our coastal life in NZ!! It's fabulous and I love the pipe and marbles hanging pole - genius! Oh wow - I love it! Wonderful colours and movement. And the pipe and marble hanger is an inspired touch! I seriously love your work. Seriously. Well this didn't turn out to be a bit pedestrian at all. The seaglass, the lovely perle, the binding, all lovely details that lift the whole thing, not to mention that very cool pole. I also like your idea of using little snippets of fabric in this sort of border - reckon that would work well too. 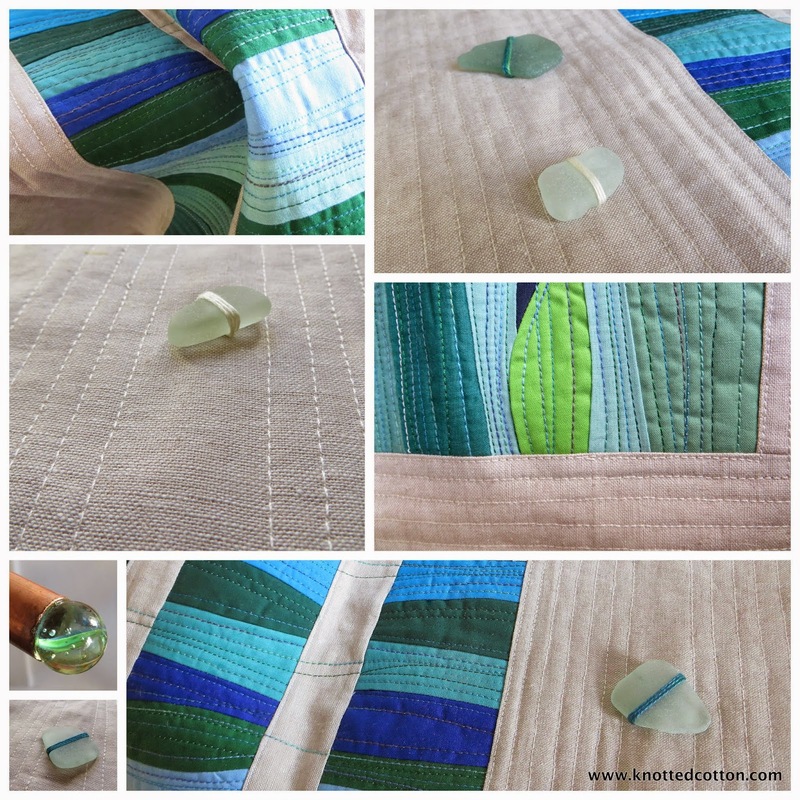 This quilt is lovely, it gives the impression of looking through a window at the sea, just love the sea glass. Your quilt is beautiful and the photos are wonderful! The glass looks perfect on it, I think it was a great idea to add them. Catherine, you don't stop surprising me with your creativity. I thought the quilt was much smaller but this one is such a beautiful display of colours, texture and your beach glass collection. Love the way you finished the rod. :-) Beautiful work!